In the likely event that you are wondering, “What is going on in this world?? ?” YES, things are changing rapidly. Humanity is quickly, or not, changing into the state of mind it left so long ago. For some, that means being faced with circumstance after circumstance of separation, in our own mind, until we realize WE ARE ONE. We are NOT separate. Each person we face is, indeed, a part of our very own self. 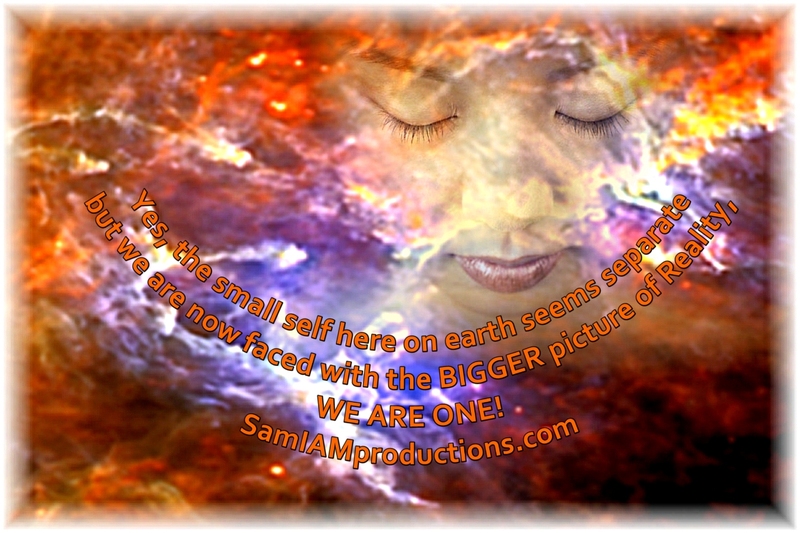 Yes, the small self here on earth seems separate but we are now faced with the BIGGER picture of Reality, WE ARE ONE in seeming, separate unique form here to experience life in bodily form on earth. So what can we do if continually faced with situations that appear negative? We can see these situations for what they are, opportunities to recognize aspects of our self, to accept them with unconditional love and to let them go (if need be) knowing WE ARE ONE, WE ARE LIGHT, WE ARE part of All That Is here to shine and share our gifts with humanity. “As the world moves further into chaos it is time to realize that this is yet another means to move all of humanity to Oneness once again. Yes, for once again humanity has stepped further away from the truth of itself, as one essence in unique forms playing and experiencing a life game on planet earth. It is with the greatest respect that we of higher realms discuss soul contracts today. For this is a necessary part of the much-needed return to Oneness. “As with all things, one must experience duality in order to tell the difference, to distinguish, between perceptions held by human minds. It has always been this way for humanity and that too is changing as all things on planet earth. But again, allow us to discuss how soul contracts play a role in this return to Oneness. “Many souls agreed to take on human form to help with this much overdue process on earth’s realm. This entails those souls who have agreed to awaken and those who agreed, very gratefully, to take on much darker roles to help their brothers and sisters, those other unique aspects of All That Is to remember their true nature. And it is through their acts of anger, their violence and much-needed chaotic acts that the unawakened souls begin the process of returning to the Light from whence all came. “This process begins with compassion, compassion for your fellow man. And it is in holding this compassion, within the heart’s core, that the Divine Spark begins to awaken. Make no mistake, each human upon planet earth carries a unique essence of All That Is. It makes no difference what their role is. This Divine Spark is the very essence all have come to awaken during this and subsequent years as earth returns to its rightful vibration of Light. * Pay attention to thoughts, words and deeds. If they continually dwell in separation, that is what will appear. * Focus on positive ways to spend time. Read inspiring books, attend and participate in groups that focus on Oneness (A Course In Miracles and A Course Of Love are two such groups). * Spend time alone without the distraction of electronics and news. Become accustomed to listening for higher realm guidance rather than counting on main stream media or others. Sharon Ann Meyer, Wayshower, SAM I AM PROductions. Feel free to share.